EVS Viscometer Bath | Lazar Scientific, Inc. 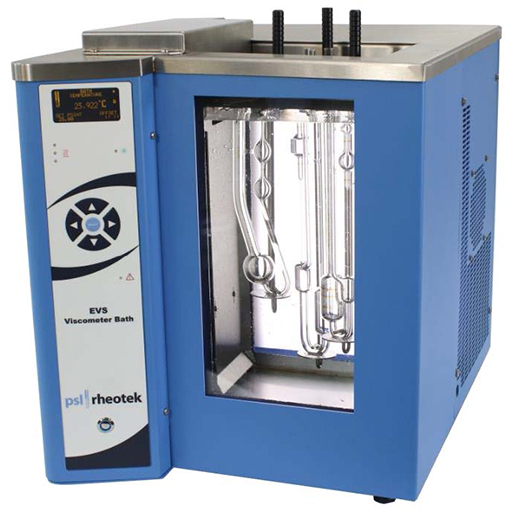 The PSL Rheotek EVS Viscometer Bath provides top performance and a modern design. Developed for product specification testing, the high precision and stability of the bath makes it the ideal base for kinematic viscosity testing in full compliance with ASTM, IP, ISO and DIN methods. PSL Rheotek EVS Viscometer bath. High precision viscometer bath +/- 0.005 degrees Cm exceeding ASTM requirements. Includes integrated backlight, OLED temperature display, three viscometer positions, two thermometer positions and bath drain. Low power consumption. Multi-voltage. Lazar Scientific is your reliable source for Viscosity Testing Equipment.